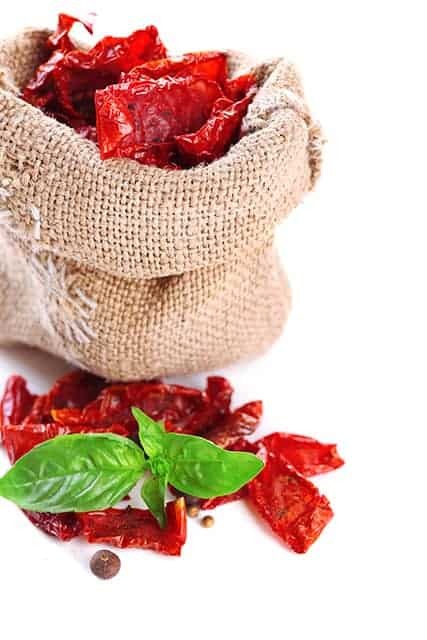 Dried tomatoes add an amazing burst of flavor to any recipe and that’s why it is a must-have in my kitchen here at the farm. As an organic farmer, the best alternative to sun-drying raw food is using a dehydrator. This tool has many advantages compared to the oven method. It gives delicious depth to my meals and it is fully packed with nutrients that our body will enjoy. There’s nothing better than something that’s good for your body and your taste buds! 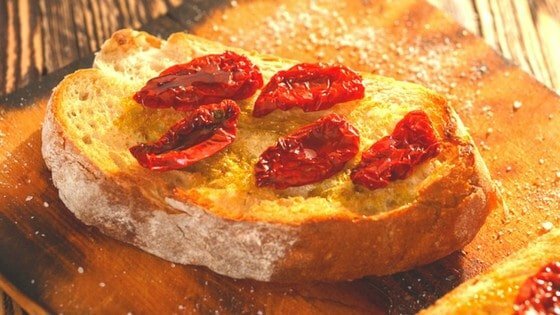 With the high cost (a whopping $20 per pound) of dried tomatoes in the store, how do you enjoy these heavenly tomatoes without hurting your budget? Simple. Dehydrate your own tomatoes! And it doesn’t have to be in the sun. There are easy ways on how to dry tomatoes. Check out these tips and tricks to drying them in your home. I know how much people enjoy eating and using dried-tomatoes in salsas, pizzas, sauce, etc. And you can’t wait to learn how to produce a bunch on your own without buying from the market. Dehydrated food can be stored and consumed for long periods of time but it can still spoil when it is kept for longer than usual. Drying tomatoes correctly and storing them in the proper conditions can give you about 7 months of shelf-life. When you dry and store the tomatoes, make sure you keep them away from moisture (especially inside the containers when already stored) to avoid the growth of bacteria. Dried tomatoes with oil, garlic, and herbs will need to be refrigerated after opening. Watch out for signs of rot. Never eat food that has already started producing molds! From the Aztecs to the tomato-loving country of Italy, drying raw food has been a reliable method of storing food for a long time. We can dry tomatoes the old fashioned way using the sun (and who doesn’t love a bit of Tuscany in their own backyard??). When you dry tomatoes the old-fashioned way, it has to be in the summer when the sun is high and the air is warm, and dry. Find out how to dry tomatoes in the sun from this action guide. • 10 tomatoes of standard size (for 1 ounce of finished product) 1. Slice the tomatoes in proportional sizes, scoop out the seeds, and lay them on the screen. 2. When drying both ends, place them skin down so it dries well. 3. Sprinkle lightly with salt and set out to dry. 4. Place the screen with the tomatoes in a good location that receives full sun and is free from predators. 5. Cover with a raised cheesecloth to keep off insects and provide good ventilation. 6. Bring the tomatoes in at night to avoid the dew. This method can take up to two weeks of bringing the tomatoes in and out the sun to dry. It is time-consuming, but you don’t need to invest in any equipment. If you live in an area that doesn’t receive a lot of sun throughout the year, we have 2 other options for you to dry your tomatoes. First, you can use your oven. Because sun-drying tomatoes can take up too much time and effort, you can use an oven to dry them faster. 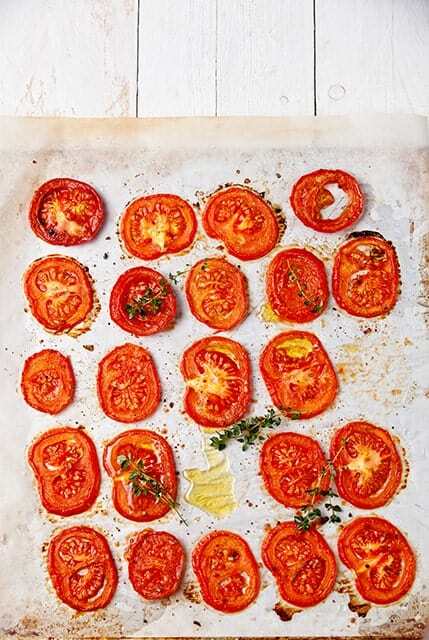 This method is pretty simple – set the oven to the lowest heat setting possible and bake the tomatoes until dried. This method takes anywhere from 6 to 12 hours. But who needs an oven during the summer? Or who wants to waste that much electricity if you know how to dry tomatoes in a dehydrator, right? A dehydrator uses low temperatures that can preserve enzymes which keeps your tomatoes good for you and not just a seasoning for your food. It uses a fan that allows proper circulation of warm air making it more efficient. It comes in different sizes which means you can dry more foods at once. Here is a quick action guide on how to dry tomatoes in a dehydrator with an amazing recipe! Slice tomatoes in uniform thickness and size. Arrange the tomatoes on the dehydrator tray and dry until all moisture is out. Store in an airtight container (a bag or a jar) and place in the fridge for long-term storage. Finally, you can enjoy that summery sun-kissed taste of dried tomatoes all-year round! 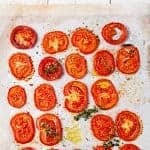 Do you have a unique way of how to dry tomatoes? Share it with us! Place the cut tomatoes in a bowl and drizzle with some salt and olive oil. Mix well and let the tomatoes dry partially. *Note that these two seasonings are optional. Dry until all moisture is out (consult your dehydrator instructions).